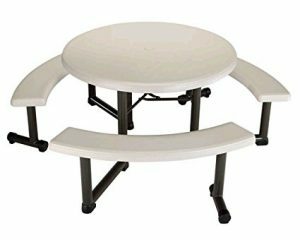 Are you looking for a ROUND picnic table that’s portable and can fold up? You’ve come to the right place to find out all you want to know about your best options in 2018! 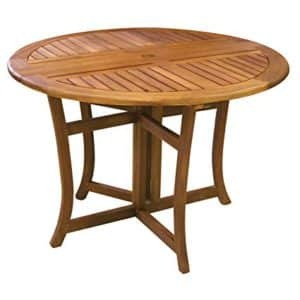 Round picnic tables are fantastic for your outdoor dining needs. Round means SOCIAL. Everyone can talk to each other! No one is more important than anyone else, no one is relegated to the end of the bench. Everyone can reach the food and drink being served, so there’s no need to pass food back and forth. Round tables are GREAT! And when they can fold for easy storage and transportation, all the better! But you already know that! That’s why you’re here… to get more details on your options, maybe pick one out. We’re here to help you make a great choice! 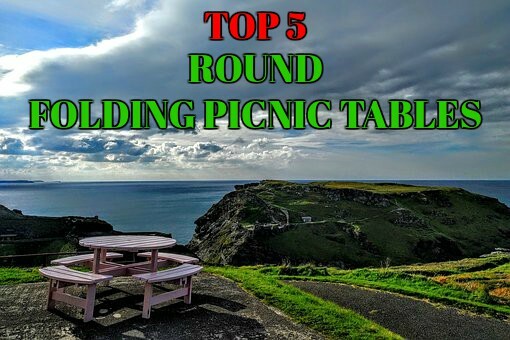 First, a comparison chart comparing the main points of the best folding round picnic tables, then a brief look at the pros and cons of each. Table Top Diameter 44" 43"
(48" available) 39" 48" 30"
Table Height 29" 29" 29" 21"-29" 24"
In half, and flat. Partially. Both sides fold down. Yes Yes. Has carry bag with shoulder straps. Special Features? Wheelchair Accessible Can also convert to side table (half circle). Wheels on table. Can store chairs in folded table. Adjustable height 4 drink pockets. Bonus lower level surface. 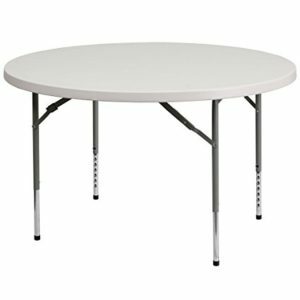 If you’re looking for a simple but effective round picnic table for your backyard, patio, or corporate environment, this IS the one you want. It’s the one with the highest reviews and the most popular choice on Amazon currently (2018). It’s solid and sturdy, even for kids who like to climb on tables. It’s look is classic, simple, yet elegant. 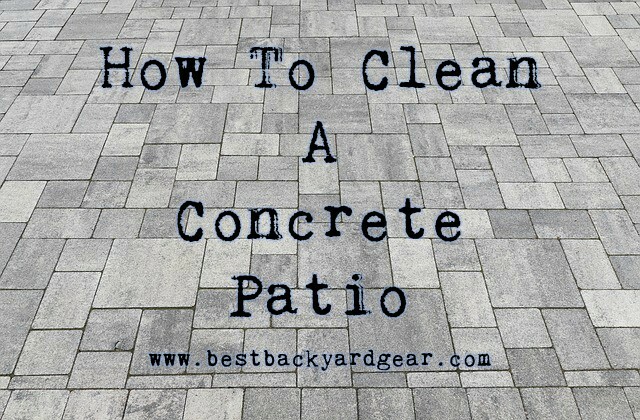 It’s solid and will last you a long time – great value for your money. If you’re looking for a stylish table for your personal backyard oasis, you can definitely find nicer looking ones. If you prefer chairs to benches, this one isn’t for you. 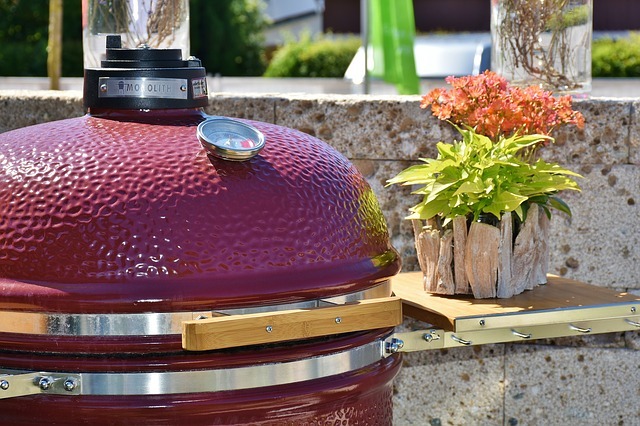 Looking for more style for your backyard round picnic table? This beautiful Eucalyptus wood table may perfect for you! You can fold down half and use as a serving table against a wall. Looking for something a littler smaller, for a small nook or balcony? 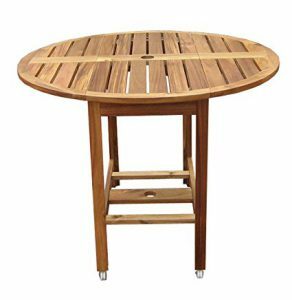 This beautiful wooden round picnic table might be just right for your needs. If you have kids or grandkids, this might be the perfect round folding table for you! Let’s take a look at this one! 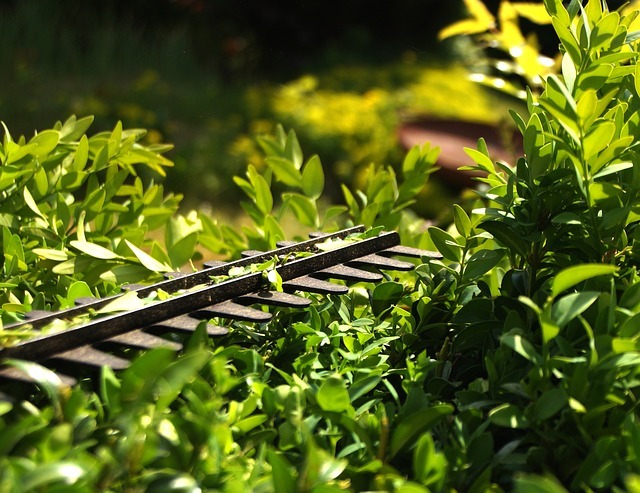 If you need to use on uneven ground, it may be hard to level, although each leg adjusts on its own. This is a unique option from the other 4… and it deserves consideration for sure! This round picnic table is your on-the-go option! 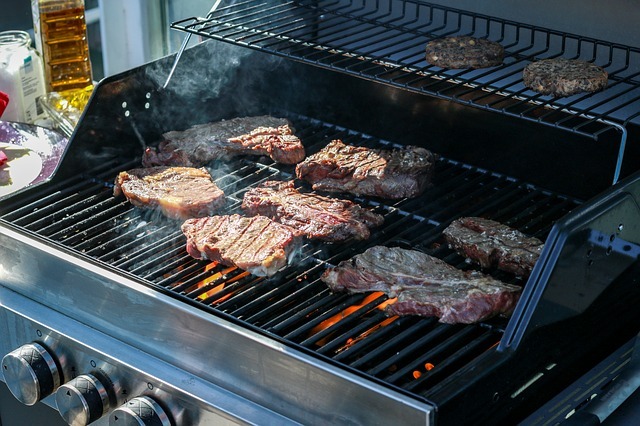 Perfect for popping up when you and some friends are spending some extra time (drinks, snacks) around your gas grill or pellet grill while the food cooks. 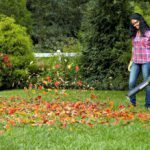 Not a “permanent” table solution – more for camping, picnics, the beach, etc. 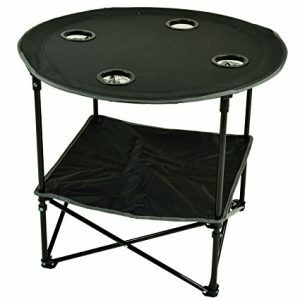 There you have it, friends… info on the Top 5 Portable Round Picnic Tables! 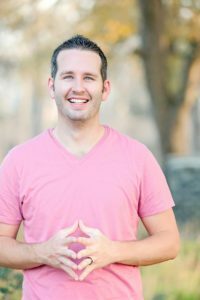 I hope this has been helpful for you! As always, if you have any questions, I’m happy to answer as best I can… and I’d love feedback or suggestions for products to review next! Wishing you a lovely outdoor dining experience, wherever you are!